Home > scrambler > Kawasaki Ninja ZX-10R Scrambler? 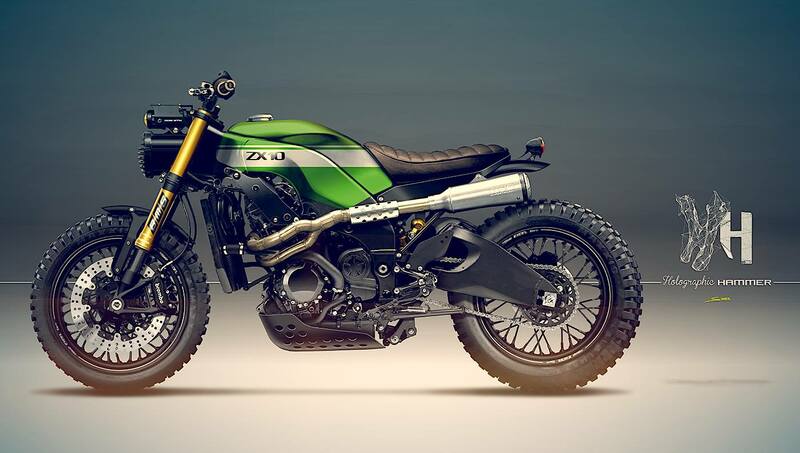 Having "scrambler" and "Kawasaki Ninja ZX-10R" in the same sentence is definitely a very confusing type of reality, but it looks like post-modernism is hitting hard into the custom motorcycle scene, as well. We've had Sylvain Berneron's creations featured on autoevolution on multiple occasions, but his recent creation is simply mind-blowing. Indonesian workshop Baru Motor Sport (BMS) commissioned a bike design with the Holographics Hammer, a name that's likely you should be more familiar with. Still, BMS was sort of pondering which direction should the new build follow. HH delivered two new ideas, though their range of applicability was significantly different. One was a custom build based on the liter-class Ninja that would stick to tarmac and be a fierce corner-carver even with all the modifications. The other one would take the Ninja in places few superbikes dare to even think about, losing all its race track attire and becoming a hellish scrambler. BMS decided in favor of the latter, and we are already dying with anticipation to see the finished bike. Unlike many other exceptional designers out there, Berneron has a propension for imagining motorcycles that can actually be built, even though at the first glance they may seem a bit too much in the fantasy realm. This ZX-10R lost all its fairings and the entire tail section, as well as the front cowl, transformed into a naked beast. A new rear subframe will be manufactured to accommodate a chopped rear mudguard and a custom solo seat covered in ribbed leather. The front fender is also a miniature piece, and makes the Maxxis knobbies look even more massive and menacing. A bash plate will protect the underbelly section of this Kawasaki, as well as the lower section of the rear suspension linkage. Holographic Hammer plans to have the entire exhaust system relocated in the traditional scrambler way, with headers running horizontally towards the back of the bike, and ending with a tunable SuperTrapp canister. Of course, the headlights will be replaced by a retro one aided by some additional projectors, while a custom fuel tank will replace the stock one. If the real bike will retain the same footrests, maybe knee-steering will be a tad difficult, possibly needing a pair of custom foot controls to revise the riding position for the sake of maneuverability in the dirt. Wire-spoked wheels are to be used instead of cast ones, but the massive radial Brembo calipers will provide premium stopping power. We can expect suspension upgrades, too, matching the motocross-inspired new bars. No word on when the machine will be ready, but rest assured we'll be all eye to spot it. And in case you wonder how do Holographic Hammer's real bikes look like, here's a very sweet custom Ducati Scrambler.